(Atlanta, GA) As students are counting down the days in anticipation to summer break, teen sci-fi author Stone Erickson and Barnes & Noble Southlake announce Fantasy Book Bowl, a pre-teen and teen summer reading program. The Fantasy Book Bowl orientation kicks off on Saturday May 31, 2014 at Barnes & Noble Southlake with free snacks, prizes, activities and more. Pre-teens and teens will receive a list of top-rated fantasy books to read throughout the summer and meet bi-weekly for discussion. Stone Erickson was awarded 2013 AALAS Sci-Fi Author of the Year to his surprise, which inspired him to launch the summer reading program to encourage his peers to read during the summer months. Stone Erickson a typical teen himself advocates kids to find books combining their interests. Pre-teens and teens participating in Fantasy Book Bowl will read a total of 6 fantasy novels during the program from May 31st- August 23rd. On each of the meeting dates a new book will be discussed from the reading list. Participants will be required to write an essay on the sixth book for the closing ceremony to be entered to win prizes sponsored by Microsoft and more and the Fantasy Book Bowl grand prize. 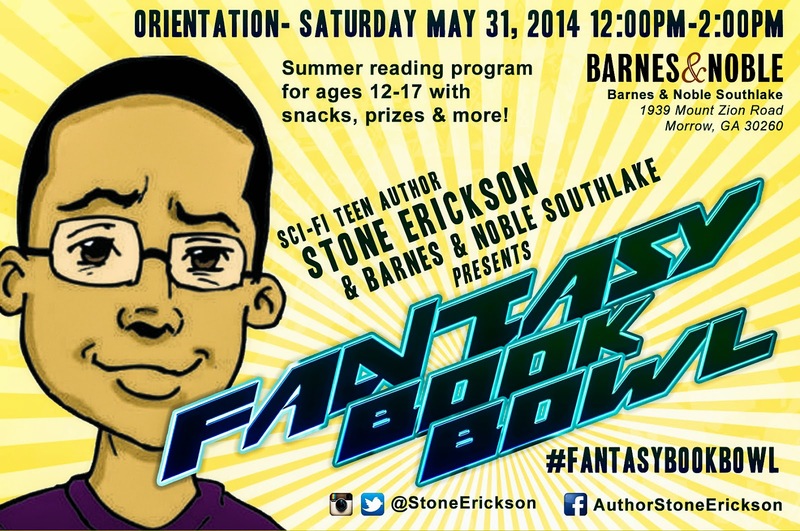 Stone Erickson’s Fantasy Book Bowl will take place on Saturday May 31, 2014 noon at Barnes & Noble Southlake located at 1939 Mt Zion Rd, Morrow, GA 30260. To register for Fantasy Book Bowl email associate@enchantedpr.net. For more information about Stone Erickson follow him on Twitter and Instagram @StoneErickson or visitwww.stoneerickson.com. For media inquiries please contact Enchanted Branding & PR, Shantez Evans at shantez@enchantedpr.net.